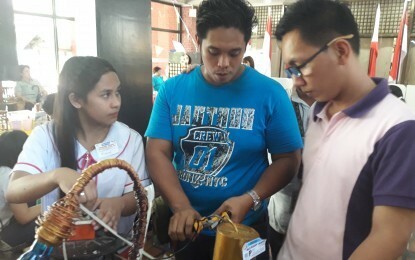 Richard Cruz and Roger Manilhig Jr., teachers at Concepcion Technical-Vocational School, show Senior High School student Rizalyn Busico the basics of electrical wire manipulation for lampshades. Rizalyn Busico, 16, is currently enrolled in the Technical-Vocational (Tech-Voc) strand in Senior High School (SHS) to earn money while studying. “Mag-aaral pa po ako sa college pagkatapos ko po ng tech-voc. Gusto ko po kumuha pa ng Education, dahil dito pwede po ako kumita habang nag-aaral (I will still study college after tech-voc. I want to take Education, because of this I can have income while studying), Busico told the Philippine News Agency (PNA) in an interview. Busico is one of the SHS students of Concepcion Technical Vocational School specializing in Electrical Installation and Maintenance (EIM) course. Richard Cruz, Busico’s Core Subjects Teacher, said EIM course focuses on electrical installation and creativity. “Many students enrol here because it’s in demand at maraming employment opportunities kapag natapos sila nagiging National Certificate holders sila (and there are many employment opportunities because when they finish they become National Certificate holders),” he said. Cruz said tech-voc classes focus on the actual practice of the lessons or theories students learn from the lectures. They only allow 20 students per class to ensure effective learning among the students. 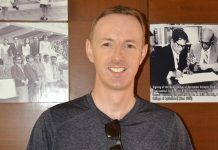 Roger Manilhig Jr., Busico’s EIM instrucctor, said they meet the students for a total of 10 hours a week — two hours is spent on theory discussion, three hours on laboratory exercises and four to five hours on application. “Theory iyan po ang scientific principles gaya ng paano nga ba gumagana ang mga circuit, conductor, insulator, kapag ang mga students ay may idea na kung paano ito gumagana ituturo na ang actual installation para sa practice nila (Theory includes the scientific principles like how circuit, conductor and insulator work, when the students already have an idea, we will teach the actual installation for their practice),” he said. Manilhig added that their students are required to create a project for every skill that they learn. Following their course syllabus, each student is expected to produce four projects in a month but most of them are able to complete only two projects due to budgetary constraint. “Tools are teacher-provided, materials are from the students. We use recycled materials to reduce expenses. Minsan yung natirang ng unang batch babaklasin nila para lang makausad sa lesson namin kasi halimbawa ang PHP100 na PVC at PHP25 na goma mahal na para sa mga bata iyan kase mahihirap lang sila (Sometimes we dismantle the projects from previous batches just so we could move on with our lesson because for example PHP100 PVC and PHP25 rubber is already expensive for them since they’re poor),” he said. Using the skills they have acquired from their hands-on lessons, EIM students are able to create lamp shades of different shapes and sizes from recyclable materials like old PVC pipes, scrap metals, rubber, jars and wine bottles. Manalhig said students consult them about the use and the design of the projects they have in mind before they start working on them. “We need to approve their ideas first, if rejected they need to think of a new one. The best of the students’ projects, we gather them, ibinebenta po ng mga estudyante iyan sa mga expo na nangyayari dalawang beses kada taon. Sa kanila po ang pera at wala kaming cut doon (the students sell them at expos which happen twice a year. The money goes to them and we don’t have a cut from their earnings),” he said. Manalhig added that they are teaching the students proper electrical skills so they can be independent and support themselves financially after SHS graduation. 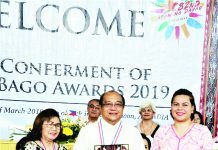 Citing the many benefits of tech-voc education, Department of Education (DepEd) Undersecretary for Curriculum and Instruction Lorna Dig-Dino said hands-on experience would improve learners’ creativity. “The best method that educators need to do is to allow our students to be actively engaged in the production process, not just let them memorize their textbooks or lessons,” she said. In September, around 400 tech-voc learners from different schools showcased their skills and products at the DepEd Central Office.